Beginning yesterday, #GivingTuesday, retailer jcpenney embarked on a 12-day tour throughout the U.S., carrying out special acts of generosity in a new city each day. The Tour builds on jcpenney’s charitable giving program, jcp cares. From Nov. 23 to Dec. 31, customers can support The Salvation Army by rounding up their store purchases to the nearest dollar and donating the difference to the organization’s Red Kettle Campaign. 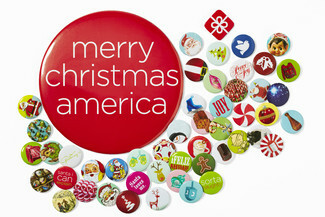 In addition, jcpenney is distributing collectible holiday buttons that have a code on the back offering customers a chance to win one of millions of gifts. On GivingTuesday only, those codes could also be entered online to unlock a $1 donation to the Salvation Army. This national ‘Giving Tour’ is an interesting blend of experiential marketing and cause. For most of the Giving Tour stops, the consumers are on the receiving end of nostalgic delights featuring experiences like free ice skating, elves serving cider and gifting jcpenney gift cards or complimentary valet service. The use of coded buttons is a clever way to drive consumers back to jcpenney’s online stores. Only time will tell whether this attempt to treat consumers to a little holiday cheer will earn the retailer and its benefitting cause additional loyalty this holiday season.